DVD02 is a 2017 Treasure Hunt and 4/5 in the Fright Cars series. 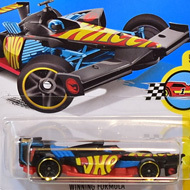 The hot rod has flat black paint with red & white wing-like graphics on the top and the Hot Wheels logo toward the rear. The sides feature a dragon face graphic with the low production symbol. The car has red tinted windows, a chrome interior, and a metal Malaysia base. The wheels are red & black with Skinny Wheels in the front and Open-Hole 5-Spokes in the back. 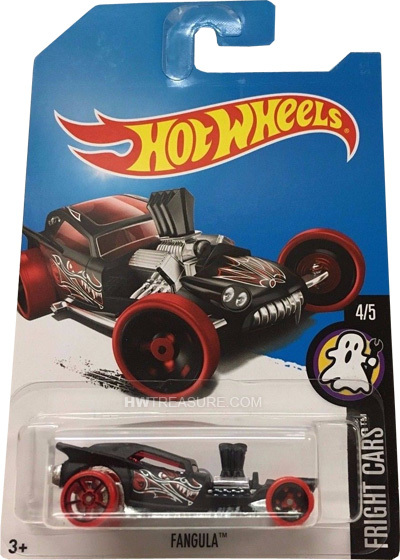 This vehicle can be found in mix “B” of 2017 Hot Wheels mainline cases. 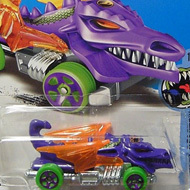 Fangula made its debut in the 2010 New Models series. It is a unique design of a rat rod with an exposed engine, side exhaust pipes, and wing-like tail fins.